This proposal has been approved and the Eclipse Ditto project has been created. In the Internet of Things two disciplines of software development come together. On one hand, a hardware influenced view of software for devices and protocols and on the other hand the view of web/mobile/business application development. It is important to make these Digital Twins accessible in a convenient way, independent of the protocols used to integrated them and the current connectivity state of the devices. The core of this Digital Twin is the information of the state of the device regarding properties and meta data. As of today a lot of IoT solutions implement functionality to manage something similar to this idea of Digital Twins. They do this by using simple databases covering some aspects of Digital Twins, which is totally fine until a certain point in time. Gradually the initially good and simple starting point gets more and more work and requires to invest in technical fundamentals instead of business level features. It would be helpful to have a domain-independent component that takes care of these mentioned aspects and can be used out-of-the-box in IoT solutions. Beyond that, this component could be used in a "back end as a service" approach to move into the direction of serverless architectures. Without the need to develop and operate a custom back end, IoT solution developers can focus again on business requirements, on connecting devices to the cloud / back end and implementing business applications. IoT solutions have to interact with a heterogeneous set of device types, device protocols and communication patterns. To bring back simplicity to IoT developers, Eclipse Ditto exposes a unified resource-based API that can be used to interact with devices, abstracting from the complexity of different device types and how devices are connected. It helps to structure the devices into their distinct aspects of functionality and can optionally enforce data types and data validation based on a formal device meta model (Eclipse Vorto). As devices are equipped with a public API (potentially public on the Internet), it is crucial to define on a device level which individuals are allowed interact with the devices. Ditto ensures that access to the device API is only granted for authorized individuals. Authentication is not scope of Ditto and delegated to existing identity providers. With this approach your devices are turned into services with a hosted, always accessible and available API. Devices managed by Ditto are usable as easy as any of the other services (like weather, maps, ...) within your application. A digital representation of physical devices consists at its heart of the state these devices. Device and sensor properties like temperature, location, level, fault information, etc. Configuration properties of sensors and actors like thresholds, intervals, ranges, toggles and limits, etc. The state management provides access to all three different perspectives and helps in synchronizing between them. When interacting with huge amounts of devices, it can get difficult to keep track of which devices and devices types are there and how they are related (e.g. spatially). It is wise to add meta data like e.g. manufacturer, model information, static geographic location, serial number or software version to devices in order to find them again later. That meta data as well as the state data is automatically indexed by Ditto which leads to fast search responses provided by the search API, even when there are millions of devices to search in. When working with sets of devices authorization information is used to determine the visibility of devices to individuals and control who can change device data. Ditto is especially useful in the context of a larger IoT landscape. In this landscape the other important aspects of a IoT solution like device communication or data analytics are covered by distinct components. The most important integration aspect is the device communication. This is essential for the Digital Twins to really be twins of real-world physical devices. In addition to provide a custom device communication layer Ditto will provide an out-of-the-box integration with Eclipse Hono to support device communication. In this scenario Ditto uses Eclipse Hono in order to receive messages (e.g. state changes) from devices and to send messages (e.g. configuration changes) to devices. The Eclipse IoT community already brings a lot of very useful technologies and components for IoT applications. As the scope of Ditto has a strong focus on the management of Digital Twins it is essential for it to integrate with these other components to provide a helpful end-to-end platform for IoT application developers. That's why Ditto does explicitly not cover aspects like connectivity and communication with devices, communication protocols, the development of (embedded) software for devices and the modeling of devices. We aim to provide the initial contribution in Q2/2017. 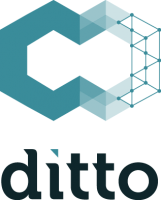 The initial contribution of Ditto will contain several ready-to-run microservices bundled as Docker images. The contributed source code is structured as Maven multi module build providing services as well as libraries on which the services are based on. provides convenient access for JSON fields, JsonPointer based operations (get/set), definitions of JSON fields, etc. includes domain model classes for Ditto, e.g. "Thing" and "Feature"
The services are implemented in Java and make use of the Akka Toolkit (http://akka.io/). The services use an externally provided MongoDB as database (https://www.mongodb.org). This is a prerequisite that has to be provided by the user and is not part of Ditto. emits published events from "ditto-things" towards the AMQP 1.0 interface via the defined "State Management Protocol"